The decoder will only accept transmissions from compatible encoders with addresses that match its own. The KH2 Series allows manual addressing through 10 tri-state pins. 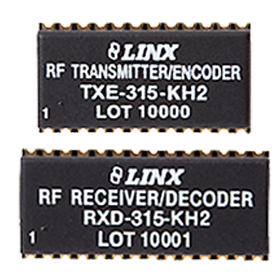 Because the address is visible in hardware, the KH2 Series is not as secure as the MS Series and HS Series encoders and decoders, which use digital addressing. Additionally, because the KH2 Series does not use encryption or rolling code, it does not protect against intentional security threats. For protection against intentional threats, consider using the HS Series with separate RF modules.